ZT's 0393 pairs an aggressive Rick Hinderer design with a solid Zero Tolerance build to create a substantial EDC folding knife. 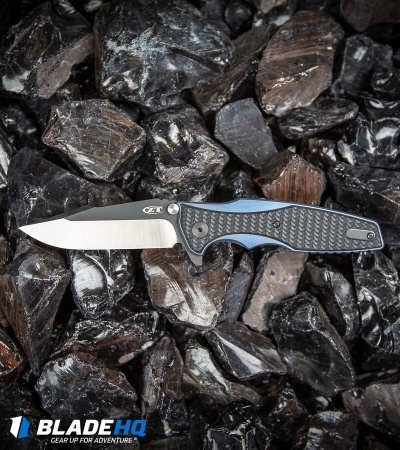 The 0393 sports a Hinderer Maximus inspired handle with a blue anodized titanium frame and custom textured, black G-10 overlays. Its Spanto style blade is made from CPM-20CV steel in a two-tone finish with satin grinds and BlackWash DLC flats. This knife is compatible with a selection of Hinderer custom hardware to make your knife stand out from the crowd. KVT ball-bearing pivot for smooth and easy one-handed opening. Reversible pocket clip for secure left or right tip-up carry. 20CV Spanto blade provides excellent edge retention, superior hardness, and piercing power. I was not 100% sure about this knife when I order it. Once I have it in hand this is a STUNNING knife. the pictures on any website don't give it the right judgment. Have had this knife for a week. I wanted to wait a little longer to write a review, but I figured they may soon be gone and if I could help someone pull the trigger, then why not. Everything you read in the prior reviews is spot on. Looks spectacular, feels great in the hand and is solidly built. Tight flipper starting to loosen up, with a smooth, fast open and a crisp lock-up. A unique blade shape that will stand out in any collection. I could go on and on. Great knife, so glad I bought it! Thanks ZT and BladeHQ! I picked this knife up about a month ago. Initially I was worried because you had to really press the flipper hard in order for the knife to open. Now that I've had the knife long enough to break it in I have almost no complaints. Solid lock, fast and smooth bearing system, great blade... just wish they could've lost the G10 and went with a full Titanium model. Overall, I still love this knife and don't regret buying it for a second! It’s not a ZT if it’s not built like a tank! Solid lockup, slightly early but nothing to worry about. 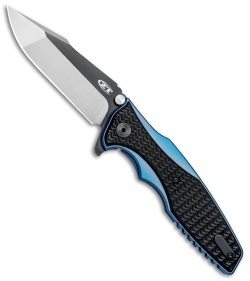 The texturing on the g10 feels great and combined with the beefy jimping this knife isn’t going anywhere. Topping it all off the anodizing, two-tone finish, and blade grind make this one sweet knife! This knife looks 100 times better in person. It's super sharp. It's smooth but takes a bit to get there. I just received my knife today and I haven’t gotten any work done since it came. I like it very much and I already see it will be my new favorite EDC. Just received this knife 15 minutes ago, so no usage on it aside from flipping it a few times. My first ZT and first flipper. It's a beautiful knife, better in hand than the pictures would indicate. I had it engraved for my wife as a commemorative blade, so I won't likely use it much. Blade is well centered, the action is smooth, but tight, as in no slop, just smooth and crisp to open. The blade is sharp, the grind is even and clean. Fits my hand well. It's everything I was hoping. Probably won't get much pocket time, but it will look great in my display case. She'll be the prettiest girl at the dance. This is my initial review as I have had 0393 in my pocket for less than 24 hours. But I don't think it hyperbole to say this is the best knife I have ever had. The action is incredible. I love the steel - in have a Grip in 20CV and a couple in Bohler M390 - so I have some familiarity with it. Great ergonomics. 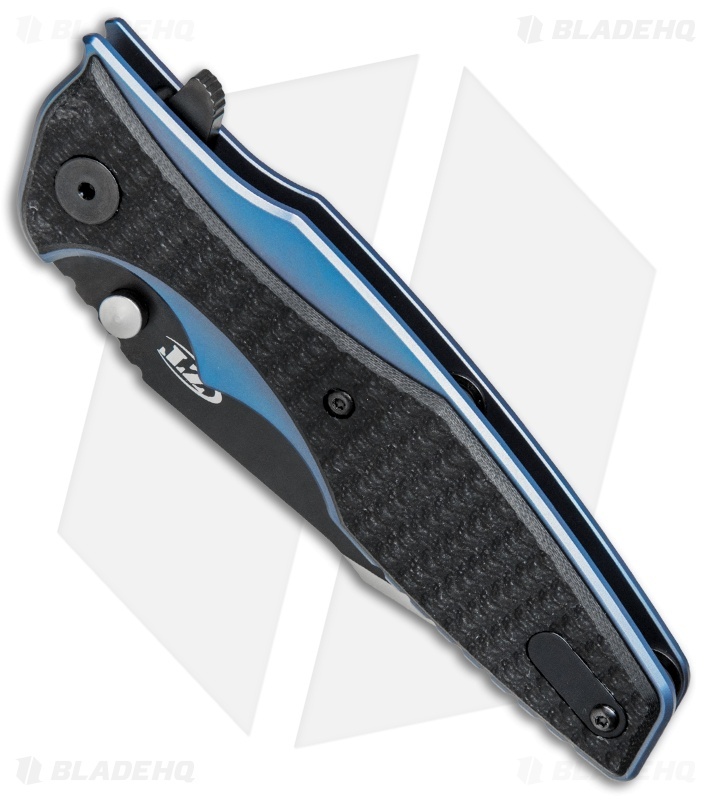 My only complaint is the clip, but I have heard the 0393 will take Hinderer hardware. Looks great, feels great, and the action is like butter. American made CPM 20CV Steel, Rick Hinderer Design (Eklipse), Titanium/G-10 Handles... Now mix it all together at the ZT factory in Tualatin, OR... and you end up with a fantastic folding knife that is truly a joy to hold in hand! Another Zero Tolerance blade I would recommend from the Hinderer/ZT line up! I have both the 0462 and the 0393 from the 2018 lineup. I find this knife in my pocket the most because of it’s toughness and quality of materials. I feel completely confident carrying it to work in a military setting. It’s stylish looks also make it good for a day where I’m just rocking a t-shirt and jeans as well! Great job to ZT on this build! Beautiful. Hinderer lines and ergonomics with ZT's quality and pricing. 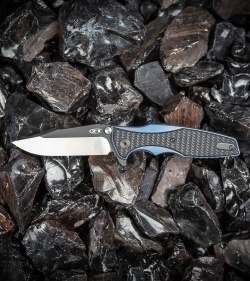 Premium CPM 20CV steel, titanium liners and G-10 overlays make it the perfect weight. I own XM-18's this was my first experience with the KVT bearing system. Wow. It fires open. Pristine Hinderer harpoon spanto with satin grinds and DLC coat flats make it very aesthetically pleasing. 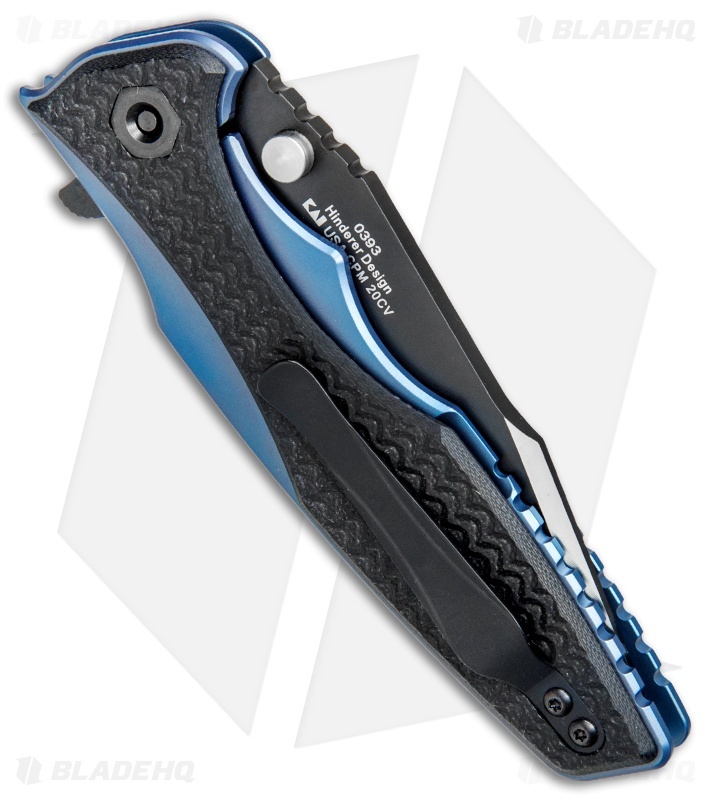 I put blue Hinderer pocket clip and tabs on. SO glad i bought this knife. This knife truly is built like a tank. I like all 3 2018 versions that ZT put out, but I have to admit while the 0462 is my personal favorite, the 0393 is the most rugged knife of the bunch. Reminds me of the older ZT’s which is a good thing. Only difference is they’ve upgraded to “super steel”, something they previously saved for sprint runs and limited editions. 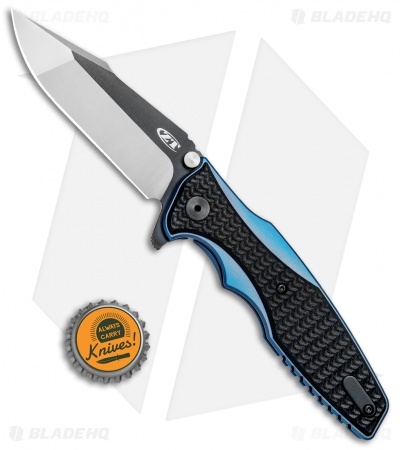 Way to go ZT for another beautiful, well built knife. ZT did it again. This knife looks, feels and functions like a custom knife. 5oz is the listed weight, but for some reason, it feels a bit lighter. The two tone blade, blue anodizing, and black G-10 make for an impressive presentation, and basically any custum Hinderer hardware will look awesome. I am impressed. Very nice production knife. I love the shape of the blade and handle and it feels light in the hand. It looks even better in person.